Hi , i paid for my subscription today 01-11-17, they took money but the application doesn’t work!! Can you help me pls?? I’m using IOS, i mean that the subscription is not active,as if i am still in free trial. My payment went through on my apple account but I can’t access my premium access anymore. My iPhone, webpage it’s the same thing. Please advise. I’m payed my services for apple store and now I don’t have premium services yet. Aún no tengo el servicio premium y ya me hicieron el descuento del servicio hace más de dos semanas en mi banco. Solicito el servicio con fecha actualizada. Hi there! Welcome to the community! This is due to an error between Itunes and Deezer. Since we can't ask for payment details here, I'd advice you to get in touch with our support team and send them a copy of the invoice from apple. They will be happy to help you with this! Hi I have paid for my subscription on my iPhone but it’s no working can anyone help?? As many others I got my premium subscription through Apple store and still have the free account. I don’t have the time to crawl through all the stuff so please fix it. And yes I checked my bank account and money are gone. Thank you. I've bought the premium plan on the appstore but my account still on the free mode, I have tried to uninstall and reinstall the app, and it doesn't work, I have tried to upgrade the account again but it says that it is already a premium account. What can I do? I will have to cancel the account if it still charges the monthly fee. I paid for the Deezer subscription but it is not working in the app. It says “You’re already subscribed” when I click the “Subscribe” button but it won’t let me listen to music offline and listen to the music I want. I already paid so it should let me do that. I don’t know what’s going on. I paid for deezer premium but didn't change my account. Hi @slawlor81, have you received the confirmation for the payment and what was the payment method you selected? we've noticed an increasing volume of topics and comments from users who paid via iTunes but their account hasn't been upgraded/ still acts as a free account. Our team is already looking into this to see if there's a problem on our or on Itunes' side. I created this topic so that we can collect all related cases and provide more data to our payment team. If you are having the same issue, you are more than welcome to leave a comment in this thread! Also if you created a thread and find your comment here, I have moved it to this one to have an overview and give you the opportunity to talk to the community and follow this subject. 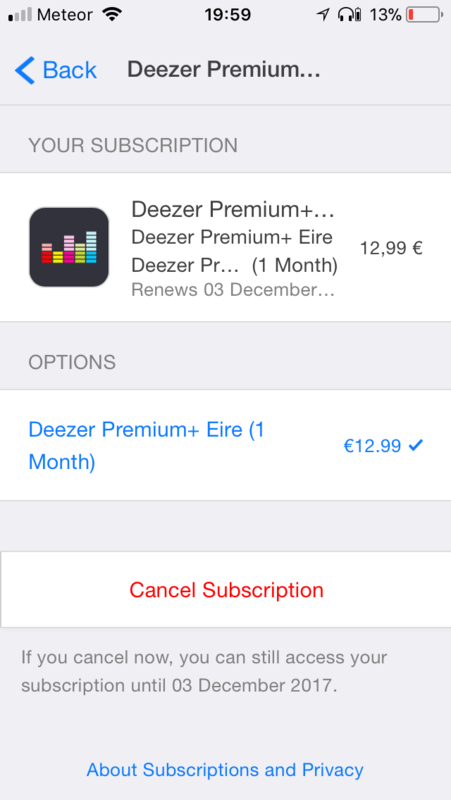 Before you post here I'd appreciate if you could check your iTunes profile first to see if the Deezer subscription is active there or if you were charged for Deezer by iTunes (how to check). If that's not the case, there was probably an issue with the activation and you can just subscribe again or contact iTunes directly. They will be able to give you more info about why it was not successful. If you need any more information or any assistant, please send us the proof of payment here. I will try my best to update you as often as possible and will let know know if there are any results or actions required by us or iTunes! Hi @Marcella.Mattos, I just checked your account and could see that it's on Premium+ now. Are you still having issues? I have also had money taken from my bank by ITunes and it has not shown on here and just says subscribe, if you’re able to help please?